The use of ultrasonic vibrations is a new technique for delivering tactile sensations to the user. A system that allows users to experience multi-point haptic feedback above an interactive surface without having to touch or hold any device will be unveiled this week [Friday 11 October] at one of the world’s most important conferences for innovations in human-computer interfaces. Multi-touch surfaces offer easy interaction in public spaces, with people being able to walk-up and use them. However, people cannot feel what they have touched. 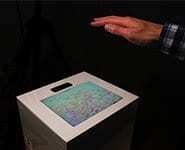 A team from the University of Bristol’s Interaction and Graphics (BIG) research group have developed a solution that not only allows people to feel what is on the screen, but also receive invisible information before they touch it. UltraHaptics uses the principle of acoustic radiation force where a phased array of ultrasonic transducers is used to exert forces on a target in mid-air. Haptic sensations are projected through a screen and directly onto the user’s hands. The use of ultrasonic vibrations is a new technique for delivering tactile sensations to the user. A series of ultrasonic transducers emit very high frequency sound waves. When all of the sound waves meet at the same location at the same time, they create sensations on a human’s skin. Tom Carter, PhD student in the Department of Computer Science’s BIG research group, said: “Current systems with integrated interactive surfaces allow users to walk-up and use them with bare hands. Our goal was to integrate haptic feedback into these systems without sacrificing their simplicity and accessibility. December 5, 2018 - December: Ultrahaptics raises £35 million | News University of BristolThe world leader in mid-air touch technology, Ultrahaptics today announced fundraising £35 million in an oversubscribed Series C round of investment. December 3, 2018 - Ultrahaptics raises $45m Series C Electronics WeeklyUltrahaptics has raised a $45 million Series C round. The new funding will support new product development and further B2B customer acquisition across glob. April 17, 2019 - Why it's time embrace the rise of multisensory experiences CampaignLiveExpanding our thinking beyond visual and auditory cues opens up powerful opportunities to connect more deeply. December 4, 2018 - Ultrahaptics Gets $45 Million to Commercialize Virtual Touch EE TimesDeveloper of virtual touch technology gets $45 million Series C funding to develop its product and commercialize its technology.